Hey there, y’all! I originally shared this recipe right before the 4th of July over at Kenarry: Ideas for the Home. Carrie and I did a recipe swap of easy barbecue side dishes, and she was here sharing her recipe for Classic Taco Salad. Be sure to check it out if you haven’t had a chance to yet! 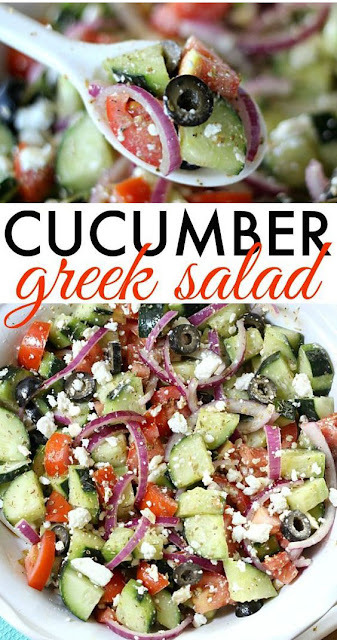 This Cucumber Greek Salad makes a great side dish to serve at almost any meal, and especially at summer barbecues. When there’s lots of yummy desserts and other heavy dishes to chow down on, sometimes I like to prepare a healthier alternative. It’s nice to have a fresh side to balance everything out, and this Cucumber Greek Salad definitely fits the bill! This salad is so easy to throw together. The hardest part is chopping the veggies, and that really only takes about five minutes. Add in some spices, lemon juice, olive oil, and feta, and you are ready to go. In a large bowl, combine cucumbers, tomatoes, and onions. In a smaller bowl, mix the olive oil, lemon juice, and dried oregano. Pour over the vegetables and mix well. Season salad with salt and pepper. Get full recipe and instructions, please visit here belleofthekitchen. 0 Response to "Cucumber Greek Salad"